Originally when I conceived this recipe, I envisioned using whole-wheat pasta instead of quinoa. But then when I got ready to make it, I was at a point of being O.D.’ed on pasta, having just made a large batch of it and eaten it over the course of several days. So I decided, why not try this with quinoa? 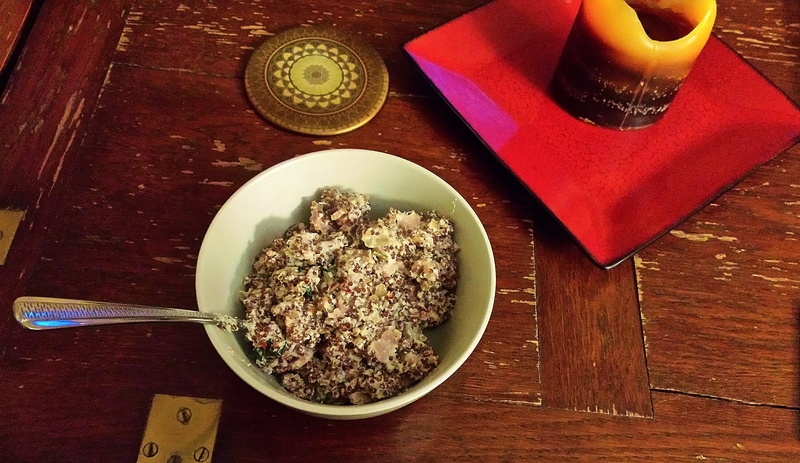 The result is not the prettiest concoction in the world, but what it lacks in looks, it makes up for in taste, being much more savory and flavorful than many of the other quinoa bowls I’ve made. And it pays modern homage to my Italian heritage! In a medium-large pot, bring quinoa and water to a boil, then cover and reduce heat to a simmer, cooking until the water is absorbed - about 15 minutes, or according to the specifications on the quinoa package. Add oil to a large saucepan and cook diced onion on medium heat for three to four minutes, stirring frequently, until lightly browned. Add pancetta and cook for another four minutes, then add garlic and cook for another two. Mix in basil, then remove from heat. Once quinoa is ready, add melted butter, ricotta cheese, and lemon juice and zest to it and mix well. Stir in pancetta mixture, crushed red pepper flakes, sea salt, and pepper and put on low heat for a minute or two, stirring constantly, until mixture is warmed through. Spoon into bowls and enjoy the rich, savory goodness! Makes 3-4 servings.